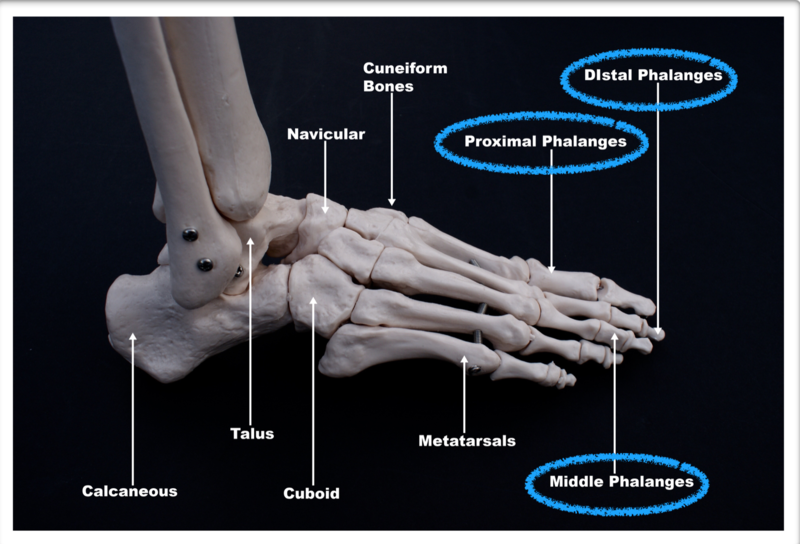 Fractures of the toes are very common in patients of all ages. The toes are very vulnerable to fractures, especially walk even around their house barefooted. Toes can hit a table, chair or wall. The patient will feel a crack in the bone and the toe may often appear to be out of place. Fractures of the toes are also common when something drops on the toes or if the toes are stepped on. These bones are very small and are very vulnerable to excessive stress or heavy objects. Pain, swelling and slight deformity are most commonly seen. Patients will often see a toe slightly out of place and put it back in place and tape the toes together. X-rays are usually necessary to evaluate the extent of the injury. In some cases nothing can be done except for taping the toe and placing it in a comfortable shoe. 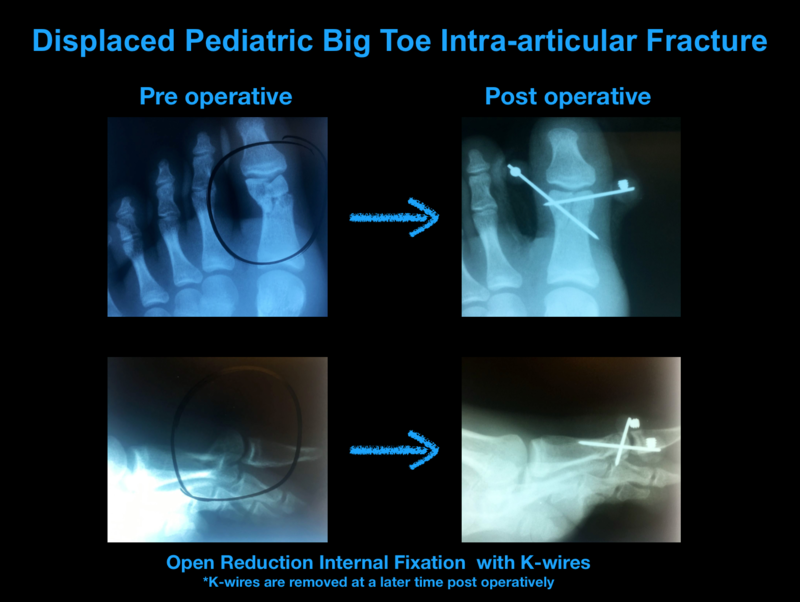 Other times the fracture can be bad enough to require a small pin to be placed through the toe to stabilize the fracture or an open reduction and internal fixation to fix the toe and prevent long-term problems. 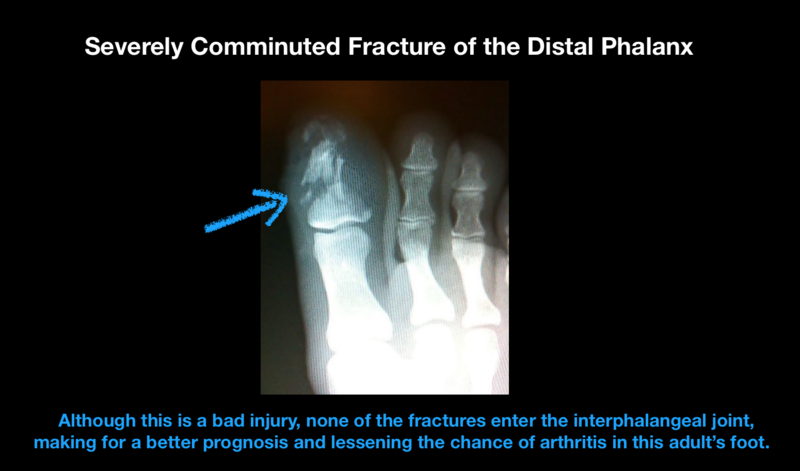 Fractures of the big toe are more serious conditions. This usually occurs from a heavy object falling on the toe. 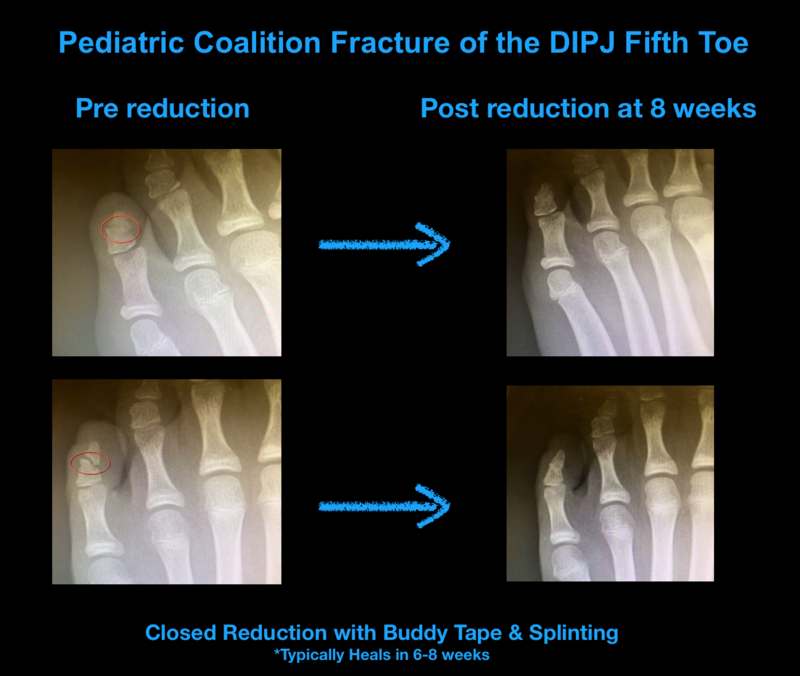 Fractures can cause the joint surface into the big toe joint or in the toe itself to become disrupted. They need to be evaluated and treated to prevent arthritis in these areas. Conservative care may be as simple as a boot or cast to unload the fractured big toe. Surgery may also be necessary to place more pins or screws in the area and allow the bones to heal primarily. This would avoid long-term problems. Crush injuries to the toes from a heavy object falling on them can be significant injuries. The bone can be fractured and even point through the skin causing an open fracture. If present they need to be evaluated and treated immediately. These are considered surgical emergencies. It is important to clean out these wounds that have been opened. Repair of the fractures is often necessary coupled with treatment of any tendon injuries that may accompany the traumatic event. The long-term prognosis is depending on the degree of injury to the area. If arthritis develops in any toe joint, then surgery may be necessary to correct the problem and prevent pain and deformity.